Hippospotamus by Jeanne Willis, illustrated by Tony Russ. Anderson Press, 2012. I love the funny language in this wacky rhyming story. 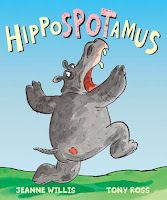 Hippopotamus has a spotamus on her bottomus. The other animals try to diagnose her problem, but none are successful until a little boy comes along, looking for his lost bubble gum... With a little practice, the fun rhymes roll off the tongue and the ending will have the kids giggling for sure. Baron Von Baddie and the Ice Ray Incident by George McClements. Harcourt Children's Books, 2008. When I held up this title, one of the boys observed "He looks like a sneaky guy!" and I asked them what made him look sneaky. They said his sunglasses, "his face" (I mentioned the crazy eyebrows), his ICE RAY, his suit and gloves. 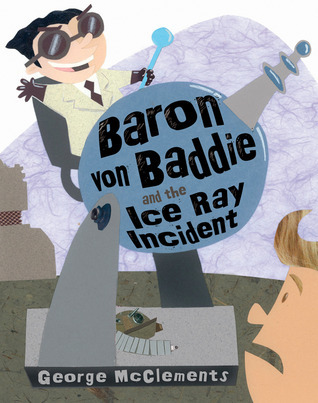 Baron Von Baddie is always coming up with evil plans and he's always foiled by his nemesis, Captain Kapow. But when the Baron accidentally freezes Captain Kapow with his ice ray, having free reign is not as fun as he had imagined. This was definitely a favorite of my kids. The text is short and makes for a great readaloud. Boy + Bot by Ame Dyckman, illustrated by Dan Yaccarino. Knopf Books for Young Readers, 2012. This is a rather quiet story about a boy who finds a robot in the woods. When the robot accidentally gets turned off, the boy tries to make him feel better by feeding him applesauce, reading him a story, and tucking him into bed. When the robot gets turned on and sees the boy sleeping, he tries to fix him by giving him oil and reading him an instruction manual. 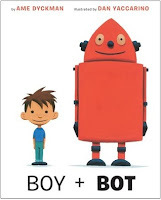 The kids appreciate the turned tables and enjoy the idea of a boy and a robot being friends. 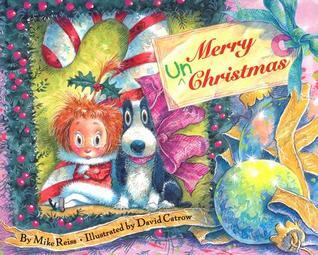 Merry Un-Christmas by Mike Reiss, illustrated by David Catrow. HarperCollins, 2006. This is my go-to Christmas book because it's KIND OF not about Christmas. I feel a little weird sharing Christmas books with my groups because I know not everyone celebrates Christmas, but at the same time they expect a Christmas book and I don't want to disappoint them. Merry Un-Christmas is about a town where it's Christmas 364 days a year, so the holiday they get excited about is UN-Christmas, the one day a year when kids get to go to school, the family eats TV dinners for supper, and the mailman comes. It's funny and the kids like it. I have used it many years in a row, though, so other suggestions for holiday readalouds are hugely appreciated! Our craft this month was scratch-art candy canes, ordered from Oriental Trading. All our groups seemed to figure out at once that if you can peel the plastic layer off, all the color on top comes off, which is way easier than scratching the whole thing. I don't know if this batch of scratch art was just easier to peel or what. The kids still love it and I'll tell them it's their choice how they want to do it. Hey, please leave suggestions of holiday books that might be good for my groups! I can definitely use some non-boring, non-religious holiday books to spice up my December afterschool visits next year. And hey, Valentine's Day is coming right up and I've already read Zombie in Love this year, so I'd appreciate suggestions for that holiday, too!